Life could not be better for Dabo Swinney. Clemson’s head football coach has transformed the Tigers into one of America’s elite programs. The squad opens the 2018 season as a favorite to claim its third National Championship which would be the second under Swinney’s guidance. Making life easier for the fun loving, gregarious Swinney, he and his wife Kathleen recently built and moved into a new house standing less than a mile from his office. While the Tigers own a place either at or near the top of the nation’s elite, the same cannot be said for their rivals South Carolina, at least not yet. Gamecocks coach Will Muschamp took over a three-win team on a downward spiral in the last two seasons under legendary coach Steve Spurrier. Optimism now abounds in Columbia as the hardworking Muschamp has those involved in the program believing USC is ready to challenge Georgia for the top spot in the Eastern Division of the Southeastern Conference. The team has won 15 games in Muschamp’s two seasons, including nine victories last year in a campaign that ended with a thrilling come-from-behind Outback Bowl victory over Michigan. Muschamp and company have even started to make noise on the recruiting trails getting a commitment from five-star 2019 defensive lineman and a top senior high school prospect in South Carolina, Zacch Pickens. The commitment marked the Gamecocks first from an elite high school athlete living in Anderson, less than 30 miles from Clemson. The Gamecocks also pulled a commitment from California’s Ryan Hillinski, rated the nation’s number two Pro Style high school quarterback. These high profiles commitments have members of the USC’s glory teams that posted a 33-6 record in three consecutive 11-2 campaigns under Spurrier excited about Carolina’s future. “We've got a lot of (defensive backs) in here,” said former Gamecock D.J. Swearinger, now a starting safety with the Washington Redskins during a visit to Columbia this summer. “Me, Johnathan Joseph, Dunta Robinson, Sheldon Brown, Stephon Gilmore, Antonio Allen, DeVonte Holloman. The list goes on. We’ve got a lot of guys in the league. We’re going to try to continue to get that. While Clemson’s 2019 recruiting class remains in the top five nationally, the coaching staff is more excited about the team it will put on the field this season. The Tigers return a mature squad with experience. It understands what it takes to win a national championship. It also knows the experience of falling a little short. The question marks for the Tigers this season are on offense where there is a battle for both starting quarterback and tailback. Senior Kelly Bryant, who started for the Tigers a year ago, is again listed as the top quarterback. He has been pushed by freshman Trevor Lawrence, a freshman listed as the top high school senior in the nation last season. Co-Offensive Coordinator Tony Elliott is looking for one thing when determining the top guy at both positions. “Consistency,” said Elliott. “The guy who can come out every single day and do the things he’s been asked to do. Obviously, we know all those guys are capable of making the big throws, making the big runs. But who can manage the system, who can be the best and most consistent? That’s the guy that wins the job. Bryant had a solid 2017 campaign, completing 262 of 398 passes for 2,802 yards and 13 touchdowns. He was intercepted eight times. He also rushed for 655 yards and 11 scores. Redshirt junior defensive end Clelin Ferrell, who returned to Clemson despite being projected to be no worse than an early second round 2018 NFL Draft pick, says the team believes in Bryant. "Maybe he didn't play as well as Trevor in the spring game and what not, but Kelly clearly was the better quarterback coming in as far as the spring as a whole," said Ferrell at an Atlantic Coast Conference preseason press gathering. "I feel like Kelly was definitely still the more ready quarterback after the end of the spring. Definitely. The whole team is behind him. That's our guy. Unless the coaches say otherwise, Kelly's our guy. "(Bryant is) a senior. He has more trust in his teammates. He knows the system. And he showed his skill and his talent through his ability to run. He’s worked really hard. He just looked comfortable. Everything flowed smoothly with him." Ferrell’s assessment was backed up by quarterback coach Brandon Streeter at a media session in late July, although Lawrence’s talent and quickness with which he appears to have picked up the system is apparent. Sophomore Travis Etienne began the fall as the starter at tailback, although junior Tavian Feaster has worked hard during the summer to take over the spot. Etienne led the Tigers in rushing with 766 yards and 13 touchdowns, while Feaster followed with 699 yards and seven scores. He also caught 12 passes for 112 yards and a touchdown. “He was the most consistent in terms of big plays,” Elliott said of Etienne. “Obviously, he is still a young guy. He has some things to improve, like pass protection. He came into Fall camp and was the most explosive guy with the ball. He was very, very productive. A boost to the Clemson offense is the return of left tackle Mitch Hyatt, a projected first or second round pick in the 2018 NFL Draft. “He never says a word,” said offensive line coach Robbie Caldwell. “You won’t get this out of him, but Mitch is a competitor. I don’t care who it is, he’s ready to compete. He loves the challenge. Whoever Elliott and fellow offensive coordinator Jeff Scott opts to put on the field, they have Swinney’s support. Elliott, who gave up a promising career as an engineer at Michelin to give coaching a try at South Carolina State and then took another pay cut to move to Furman because he thought it would strengthen his resume, discovered Swinney’s foresight first hand. Although he was a walk-on wide receiver at Clemson and coached that position at South Carolina State and Furman, Swinney called to gauge his interest in coaching running backs for the Tigers. “I didn’t think I really had the opportunity,” said Elliott. “I had been a wide out coach for five years. I played wide out. Now, there’s a running back job. My conversation really was ‘Coach Swinney, I’m good. Even though our head coach was fired, I got retained. I even got a little bit of a promotion. I’m recruiting coordinator now. I’m really good. “‘You do what you need to do improve your program. But, if there is an opportunity in the future, let me know.’ But he had different plans and I think that’s what separates him from the rest of the coaches in the country, the vision he has to see things. He’s got instincts. A few years later, that’s exactly what happened. When then offensive coordinator Chad Morris left to become head coach at SMU, Swinney was convinced Elliott and Scott were prepared to fill the position. That meant Elliott would be calling plays. There is no question that the leader at quarterback for the Gamecocks is Jake Bentley who begins his third season as starter. The junior has a new offensive coordinator as Bryan McClendon has taken over after leading Gamecocks on that side of the football in the Outback Bowl following the dismissal of then offensive coordinator Kurt Roper. “Bryan is a guy that in two years that I've worked for USC, number one, is extremely bright; number two, has a tireless work ethic; but has the unique ability to be very hard on his players, and his players still love and respect him and that's hard,” said Muschamp. “Not a lot of coaches are able to have that trait. I watched the guy take over a very difficult situation in a bowl game with an intern tag at the time and be organized and detailed, and did a great job game planning. But, more than anything, did a fantastic job adjusting at halftime, had command of the staff, command of the team. McClendon has installed a fast pace offense. The move has Bentley and his offensive teammates excited. “I think it's one of the best things that has happened to me as far as my college career,” said Bentley. “I think it allowed me to slow down my mind and the fact that I'm open for anything. It's been different for us, there have been some bumps in the road when we're going over it, but I think it's going to be real good for us." "(McClendon) is just very aggressive. He has a very aggressive mindset. I love him, the guys love him. He wants to score as many points as he can every single game, and the guys have really fallen into that. They understand that any play can be a touchdown. I think the biggest change that I've seen is when a guy just has, maybe a vertical that he thinks is just trying to throw out the defense, but it really could be a play that could score." The Carolina offense has also been enhanced by the hiring of Dan Werner as quarterback coach. Given the nickname ‘The Quarterback Whisperer” because of his success developing athletes at the position, has already had an impact on Bentley and the remainder of the USC quarterbacks. Giving the Gamecocks confidence the offense can produce big plays is a receiving corps that may be the best in the SEC. 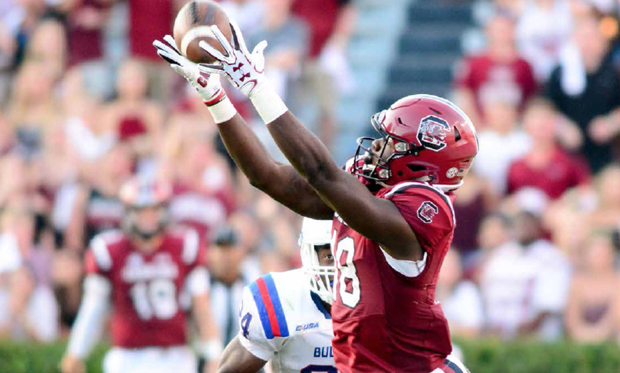 It is led by senior Deebo Samuel, who got off to a fast start in 2017, but suffered a season ending ankle injury in the third game of the season against Kentucky. "Not only did the offense take a hit confidence wise, but it hit the whole team,’ Bentley said. “When you've got a guy like that who you know can make a game change with one play not be out there, I think it took a toll on us a little bit. But when he got back out there, you can just see the guys' confidence in him and what he is able to do. Not only is he a great player, he is a great teammate as well. He's a very good teammate, a very selfless guy." While Samuel probably could have opted to forgo his final collegiate season and declare for the NFL Draft, perceived unfinished business led to his return to USC for his senior season. Samuel caught 15 passes for 250 yards and three touchdowns, while rushing twice for 30 yards and a score. He also returned two kickoffs for 197 yards and two touchdowns. "In previous years, before I broke my ankle,” said Samuel, “I had hamstring issues which made me sit out a couple games but not for the rest of the season. When you break your ankle, you can get down on yourself. You can say to yourself, `Maybe football is not for me.' I didn't look at it that way. I had motivation from coach Muschamp, coach McClendon and my parents to motivate me to be able to push myself to get back to where I was before I got hurt." Samuel is joined by junior Bryan Edwards and sophomores Or’Tre Smith and Shi Smith. Edwards led the Gamecocks in receiving with 64 catches for 793 yards and five touchdowns, while Or’Tre Smith had 30 catches for 326 yards and three scores. Shi Smith had 29 receptions for 409 yards and three touchdowns. USC also returns its top three running backs, Rico Dowdle, Ty’Son Williams and A.J. Turner. The Gamecocks must replace tight end Hayden Hurst, a first-round selection of the Baltimore Ravens. Jacob August and K.C. Crosby appear to be the leading candidates. The offensive line, a USC weakness in recent years, could transform into a strength in coach Eric Woolford’s second season with the team. Senior Donnell Stanley moves to center, while Zack Bailey returns at tackle. “We’ve all been working hard during the offseason,” said Stanley. “We barely have any time off. We have committed ourselves to the weight room because we don’t want to consider ourselves a weak position. Last year we started nine guys. You have to learn to play more than one position. Both teams should be stout defensively. Clemson has built a tradition of dominating defenses under coordinator Brent Venables, who recently became the highest paid college assistant coach in the country after signing a five-year, $11.6 million contract. The Tigers have what many consider the most dominant defensive line in the country as Ferrell, Christian Williams and Austin Bryant returned to school instead of moving on to the NFL. Each was projected to be no worse than a high second round pick. There is also depth as Albert Huggins is pushing to earn a starting slot. Despite the talent up front, Swinney isn’t ready to ready to call the group Clemson’s all-time best. “We’re a long way from that,” smiled Swinney. “They look good on all these preseason magazine covers. They’re really good-looking guys. They’ve got to go earn that. We’ll see. There are a lot of good looking lines. I’ve been around some great defensive lines. “(Former Clemson great) Grady Jarrett would be the first one here saying (wait a minute), along with (former Clemson and current Atlanta Falcon defensive end) Vic (Beasley) and those guys. It would appear the group opted to return in order help the squad earn its second national championship under Swinney after falling to Alabama in the College Football semi-final game last season. According to Ferrell, the reasons the group remains at Clemson weren’t that complicated. "It speaks to the type of players we bring in, type of guys we bring in, the type of coaches you have there," said Ferrell. "I talked to a couple of people about it and one of the big reasons why we were OK with coming back is I know you both have seen juniors declare early and you’re like ‘why would they do that?’ You don't really understand. For a lot of guys, the schools that they’re at, they don't really like being there unless its football season. "But for Clemson, it's a type of atmosphere where you can be there year around and you'll enjoy yourself if you really enjoy the college experience." That is what it's about with Clemson. Not just the football but the people, the food…The coaches and the places we’re living is on the lake. We are two hours from Atlanta. It's a great place to be at just to have a good time as a young person so that was a great comfort. It's like you’re not going back to school, I decided to come back home." USC defensive coordinator Travaris Robinson doesn’t have players with the reputations of the Tigers front, but he took advantage of the talent on hand as the Gamecocks improved throughout the season. Linebacker T.J. Johnson led returners with 88 tackles, two sacks and a team leading three fumble recoveries. Tackle Javon Kinlaw and D.J. Wonnum were the dominant forces up front, with Steven Montac and Rashad Fenton standing out in the secondary. Linebacker Bryson Allen-Williams lends experience and a cool head to the unit as he returns for a fifth season following an injury that prematurely ended his 2017 campaign. The Gamecocks were particularly successful creating turnovers picking up 14 fumbles and the same amount of interceptions last season. They tied the Outback Bowl record for most takeaways with five in its win over Michigan. Muschamp is also excited about the facilities upgrade at USC where the Cyndi and Kenneth Long Family Football Operations Center is scheduled to be completed in December. Among the amenities in the 110,000 square foot football building is a two-story, 20,000 square foot weight room, coaches offices, a barbershop inside the team locker room and the Darius Rucker sound studio. “It will be as nice a facility as there is in the country,” said Muschamp. Clemson enters the season ranked number one in several national polls. The Gamecocks haven’t ascended to that level, but have made several top 25 polls and are trending in the right direction.